Sunday to Monday: Does anyone know what time it is? Sometimes things don’t go exactly as planned. We arrived to the Dayton airport in plenty of time on Sunday only to find out that our flight to Washington, DC was delayed. We already had a tight layover in DC, so this delay made it necessary for us to completely reroute ourselves. Instead of going from Dayton to DC to Geneva to Valencia, we ended up with flights booked from Dayton to Chicago to Frankfurt to Valencia. All in all, our new arrival time in Valencia was only an hour later than our originally scheduled time. 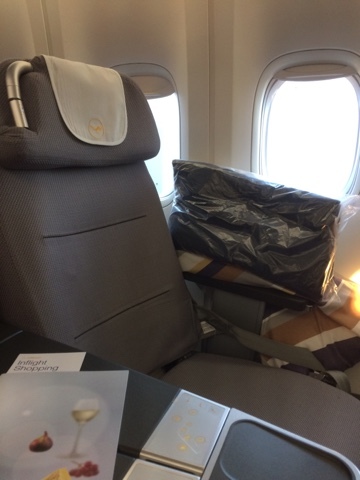 For some reason, when the United ticket agent rebooked my flight, Lufthansa put me in Business class on both the flight to Frankfurt and the flight from Frankfurt to Valencia. With a moderate amount of guilt as we boarded, I said farewell to my travel partner, Mandy, and made my way into the yet unknown community known as business class. I admit that I might have looked a little silly at first. There are so many buttons, compartments and freebies in business class. I had to check everything out. There is even a full compartment in the seat back in front where all personal items are stored. None of this “under the seat” business. I do think thought that I might have had a black X on my reservation because no one offered me a pre-boarding cocktail :(. Everyone else had one. When the time came to order my dinner, all three of my choices were gone and I was only the 3rd row of passengers to order. Hmmm! No matter what the reason, they could have fed me cardboard the entire flight because what really mattered in business class on a transatlantic flight was the fully reclinable seats. With my own large pillow, full sized blanket and complimentary socks, I was able to actually get a little rest. When it was time to eat, there definitely was a big difference in meal quality. For my appetizer, I had a rare beef salad with cranberries, fresh nut bread and a wheatberry vegetable compote. It was delicious! For my entree, I wanted the seafood, but was given the beef short ribs with sweet potato purée with roasted parsnips, summer squash and brussel sprouts. It was all delicious. While there is no consensus on drinking alcohol on a transatlantic flight (does it help or hurt when it comes to jet lag? ), I couldn’t help myself when they offered me a delicious white wine from Germany. It was fantastic! The specific wine was the 2015 Burkheimer Grauer Burgunder Spatlese trocken. When in Rome, right? Or when en route to Germany, have a German wine, right? For dessert, I had a small piece of pumpkin cheesecake. After all, you only live once, right? Plus this entire European adventure has brought back memories of my last visit to Europe in 2004. I came to visit my brother Fred and his wife Nicolle who were working in southern Germany. If Fred’s short life has taught me anything, it’s to eat the darn cheesecake and drink a good glass of wine. Life is worth celebrating, even if it’s next to a complete stranger on a flight to Germany where few speak English! I live for this stuff! Sleeping in a full lay down airplane seat was pretty easy, but by the time dinner was cleaned up, we only had about 4 hours until they woke us for breakfast. I’m pretty sure I slept the entire time. At 6am Frankfurt time (midnight in Ohio), the lights came on and freshly squeezed orange juice was served. I was extremely thirsty from the dry air on the flight and didn’t waste any time drinking it, a bottle of water and some really strong hot coffee. 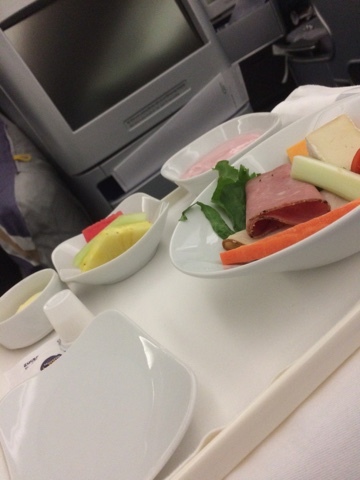 Breakfast was the traditional European style of cold meats and cheese served with crudités, a hard roll, yogurt and fresh fruit. 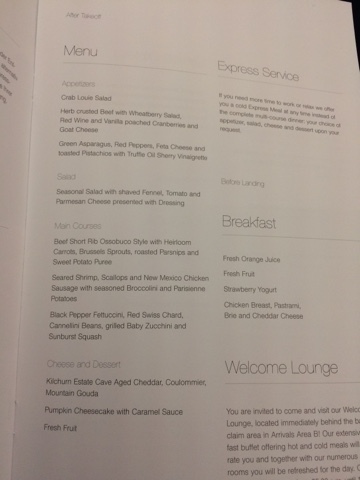 The delicious mango was definitely an upgrade from economy class! I also enjoyed the individual jar of bitter orange marmalade to spread on my roll. Our visit to Germany was rather brief, but I do have to say that the Frankfurt airport is huge, airy, light and clean! Our Valencia flight was delayed briefly which gave just enough time for the real fatigue to hit us both. With any luck, we will arrive in Valencia at noon with enough energy to get us through until a respectable bedtime. Is 5:30pm too early?? ← OMG! I’m going to Spain this weekend!